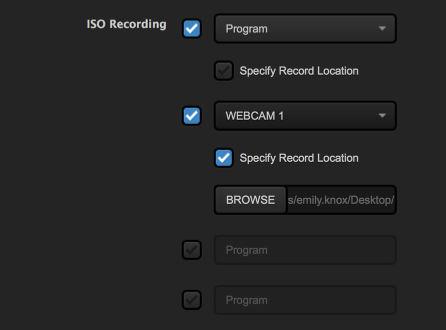 Livestream Studio includes various ways to record your Program and ISO recordings. Recordings are saved in a user-selected destination folder; by default, you can find the files in the Videos folder on Windows and the Movies folder on Mac. 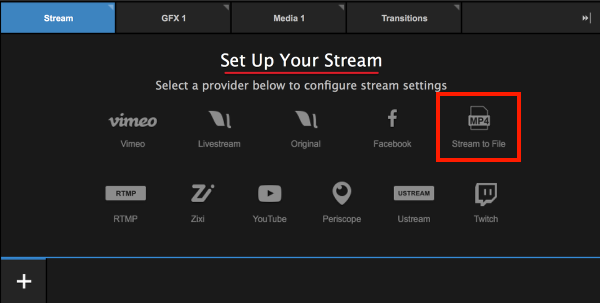 If you are just looking to record an .mp4 of your event, you can do this via the Stream tab. Select Stream to File as your destination. 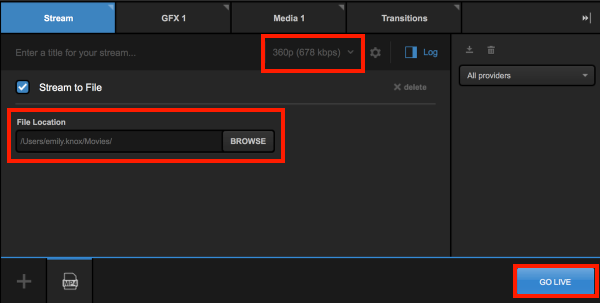 Choose the quality you wish to encode at and choose where you want to save the recording (by default it will save to the Videos folder on Windows or the Movies folder on macOS). You can also add a title, which the file will save as alongside the date in your hard drive. When you are ready to start encoding, click Go Live. The Studio Log will indicate the encoding has started. When you are ready to stop recording, click the red Streaming button in the bottom right corner of the Stream module. Your recording will be saved in the location you specified. 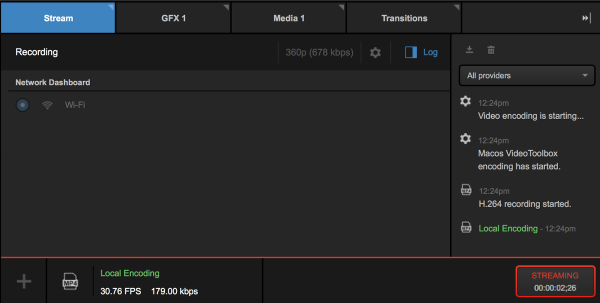 If you are looking for a broadcast quality high-resolution Motion JPEG recording of either your Program output or any of your isolated (ISO) video sources, navigate to Studio settings by clicking the gearwheel button in the upper right corner of the interface. Navigate to the Recording tab on the left side of the menu. The default recording location is where your recordings will be saved (by default, "Videos" for Windows computers and "Movies" for macOS). Click Browse if you want all of your recordings to save somewhere else, such as an external hard drive. The Default file format of your recording will be MJPEG by default. H.264 is covered in a section below. Farther down in the menu are your ISO Recording options. With MJPEG selected as the default file format, you can run up to four recordings simultaneously. This is helpful if you wish to edit your sources together in post-production or you intend to use the basic replay feature. Each checkbox will activate a recording. Select which sources you wish to record. Program (clean) is your Program recording without any graphics overlays. Choose this if, for example, you need to repurpose your recording for different brands. Below each source selection is the option to Specify Record Location. 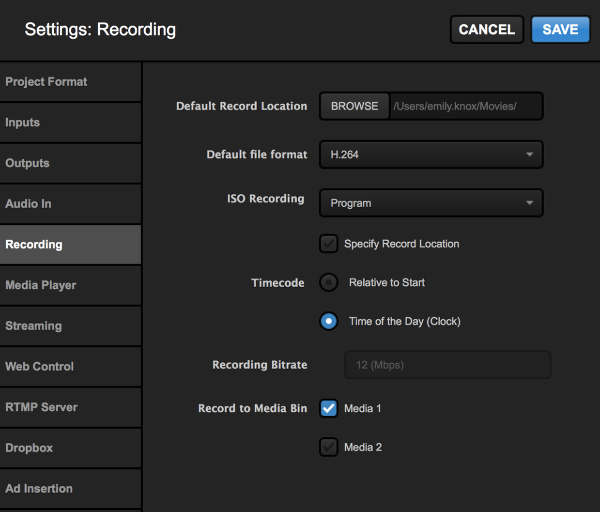 This allows you to save any of your recordings in a location separate from the Default Record Location configured above. Below your ISO recordings specifications are additional settings for your recordings, include how timecode is recorded, your recording bitrate, and the ability to also save your recordings in either Media bin. Record to Media Bin is essential if you intend to use the basic replay feature. Once your recordings are configured, save your settings. To start recording, click Record in the upper left corner of the Studio interface; click it again to stop recording. You can find your AVI in the specified recording location(s). If you are operating on a system that supports hardware encoding, you can also record an .mp4 file of either your Program or a single video source. Click the gearwheel button in the upper right corner of the Studio interface to enter the Settings menu. If your system only has NVIDIA NVENC for hardware encoding, this feature will not work if your project is set to interlaced formats (e.g. 1080i59.94, 1080i60). Unless your PC or Mac also uses Intel QuickSync, change your project format to a progressive format (e.g. 1080p30, 720p30) or to use this feature or switch the Recording settings to MJPEG file format. Select the Recording tab on the left side of the menu. You can change the Default file format to H.264 to create a compressed recording that consumes less hard drive space than the MPJEG recording. 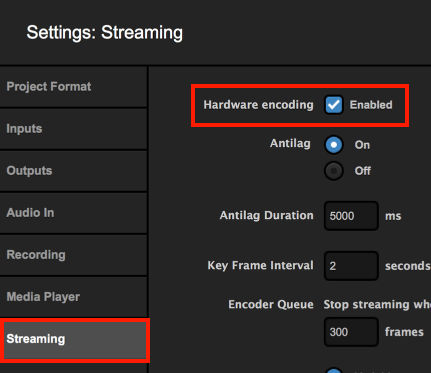 If you do not see this option, navigate to Settings: Streaming and make sure Hardware encoding is enabled. If you do not see an option for Hardware encoding, then your system does not have the proper hardware installed to support it. 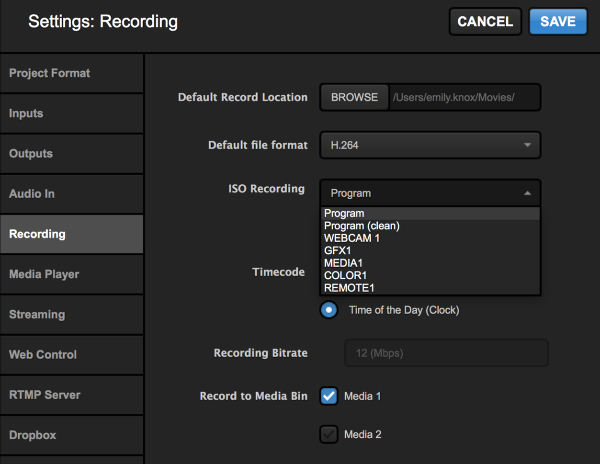 This setting only allows you to create one ISO recording, as opposed to four hi-resolution recordings. Choose which source you would like to record. You can specify a record location that is different from the default setting by checking Specify Recording Location. In addition, you can configure which timecode your prefer, recording bitrate, and whether to also record your source into the Media Bin (essential if you plan to use the Basic Replay function). Save your settings. When you are ready to start recording, click Record in the upper left corner of the Studio interface. You can find the .mp4 file in your specified record location. When you stream to any provider, Studio will by default save a backup .mp4 recording of your Program to your hard drive. You can change these settings by clicking on the gearwheel button in the upper right corner of the Studio interface. Navigate to the Streaming tab. 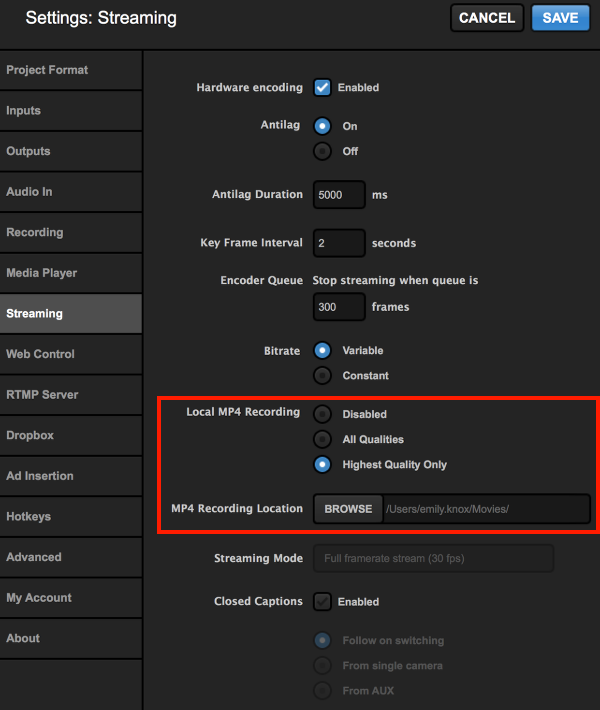 Towards the bottom, you will see settings for Local MP4 Recording and MP4 Recording Location. We recommend leaving Highest Quality Only selected, as this will record only the file of the highest selected bitrate when you configure your stream. If you choose All Qualities and select a multi-bitrate streaming quality, your system will record separate files of each quality, which can tax your CPU. Unless you are also recording separately using the methods described above, we do not recommend disabling the local recording. By default, the MP4 Recording Location will be either the Videos folders on Windows or the Movies folder on macOS. You can click Browse to choose a different location, such as an external hard drive.